Visit the MOSSVALE TALES SHOP for pricing and selections. Through the Fern Glade, and deeper into the Woodland realm, is a miniature world within our own—a world where magic exists, and existence is the very essence of magic itself. Emerella comes from the Dovely clan of woodland sprites known throughout the land for their skill with a needle and silkthreads, and flair for their flair for faerie fashion. Emerella is well received wherever she flutters, for with her, she brings inspiration, creativity, and diligence. Hang her wherever you need a reminder that whenever you do your best, the time takes care of itself. Through the fern glade and deeper within the woodland realm lies a miniature world within our own--a world where magic exists, and existence is the very essence of magic itself. The bogy called Poe comes from the muddy banks of Toad Bog, a place protected by huge ugly toads that serve the bogy realm. For the bogies are shadow creatures, skilled with hexes and charms, like the one Poe enchanted her pet spider with. It hitches a ride on her dress and repairs her rips and tears with silken web, while Poe guards the realm from intruders. Let Poe be a reminder that shadow and darkness help us better see the light. From the Mossvale Tales series. Through the fern glade and deeper into the woodland realm, is a miniature world within our own--a world where magic exists, and existence is the very essence of magic itself. As Mother Nature’s Butterfly Baroness, Synna ushers in the first of New Spring’s butterflies with her sweet lullaby lyrics—a sound only tiny butterfly ears would recognize. From inside their delicate chrysalis, butterflies hear Synna’s dainty call, and emerge anew, taking flight with magnificent wings of beauty. Synna is one pixie who will always remind you that the best things in life are free, and even the smallest of creatures add harmony to the world. Through the Fern Glade, and deeper into the Woodland realm, is a miniature world within our own—a world where magic exists, and existence is the very essence of magic itself. Oleander comes from the Sapweed clan of wood sprites, known for their wisdom in faerie folk history, magic, and culture. Oleander has a natural flair for faerie dialect and specialty spells, and is often the best in her class in obscure words and antiquated anagrams. As with many of the Sapweeds before her, Oleander's goal is to have a class of her own at Fig Hall someday, where she can instruct and inspire all who want her share a bit of ancient wisdom to apply in your own daily routine. Through the Fern Glade, and deeper into the Woodland realm, is a miniature world within our own—a world where magic exists, and existence is the very essence of magic itself. Veraina comes from the Buttercup clan of woodland sprites known for their tree and flower enchantments. Whenever a plant is dying, a member of the Buttercup clan is summoned for their ancient words of Woodland wisdom, to help it through even the most bitter cold or darkness. Hang Veraina wherever you want her whispers to promote and nurture the most strength, health, and vibrance . Through the Fern Glade, and deeper into the Woodland realm, is a miniature world within our own—a world where magic exists, and existence is the very essence of magic itself. Petra comes from the Pumpernickel clan of wood sprites known throughout the land for their wizardry with medicines, seasoning and spices. A Pumpernickel always knows just the right herb or accent to flavor any meal, as well as which plant offers remedy for aches and pains. Making the mundane magnificent is their specialty when it comes to baked goods, and Petra has been called a genius when it comes to knowing just the right aromatic spice for any situation. Careful and precise, Petra weaves its essence in the air wherever she hangs, so let her be a reminder to take a deep breath now and then, for life itself is nurturing and good. Through the Fern Glade, and deeper into the Woodland realm, is a miniature world within our own—a world where magic exists, and existence is the very essence of magic itself. Calilla comes from the Cricklewood clan of wood sprites known throughout the land for their skill in music making. They craft whimsical faerie instruments called windolins, and when played, their magical music mirrors the mood of any gathering through precisely sweet heartfelt melodies. Calilla can often be heard humming along and dancing to the windolin moon tunes, so hang her wherever you may need a little mood music, and listen closely for her dainty tune. Through the fern glade and deeper within the woodland realm lies a miniature world within our own--a world where magic exists, and existence is the very essence of magic itself. Twinkle is a starlight sprite born from celestial ancestors, and she brings with her the gift of listening. From far away, she hears your most perfectly precious wishes, and waits for the perfect moment to appear. She knows that wishing on stars is anything but silly, and she loves to hear what your heart desires, as long as it's accompanied by a good deed. Let her be a reminder that no matter your age, you’re never too old to dream. In the hidden realm of Mossvale, deep within the Woodlands, is a pond like none other--alive with finely finned folk, called minnow-maidens and minnow-men. Aquabela comes from the freshwater clan called Summerscales, and she spends her days flipping close by the banks of the lily-pad grotto, where she also likes to bask in the rays of the sun with her sister Riva. When night finally falls, the two serenade the moon with an ancient tune before diving back to their underwater realm. 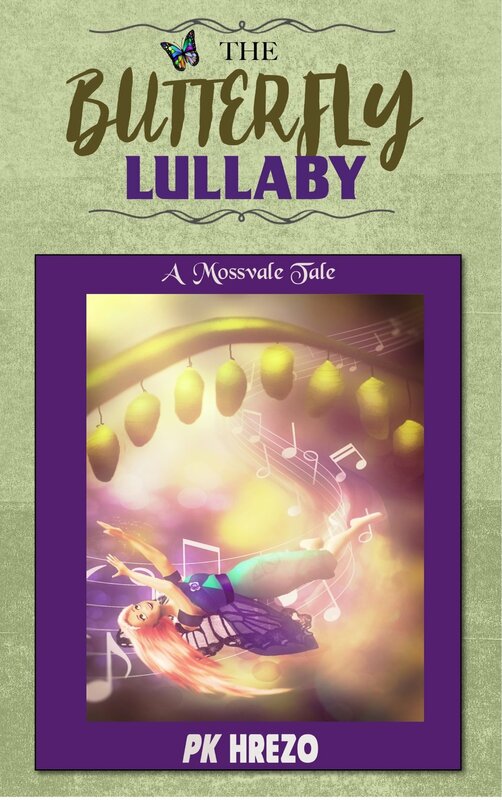 Each Mossvale Tales character, also known as the woodland sprites, comes with her own story, and star in the main story, The Butterfly Lullaby. Gift packages are available for $35 that include the print book, sprite doll, and tiny bottle of pixie dust. (price includes shipping) These are also available wherever the Pixie Pop-Up will be next. Character availability will vary. Collect all the Mossvale characters. The Butterfly Lullaby is also available as ebook for only .99. Download today, and be sure to leave a review. to quiet the spirits passing through. but Lucinda is hasty on her broomstick. protecting your home, and all she would meet. Through the Fern Glade, and deeper into the Woodland realm, is a miniature world within our own—a world where magic exists, and existence is the very essence of magic itself. Vinya comes from the Buttercup clan of woodland sprites known for their tree and flower enchantments. Whenever a plant is dying, a member of the Buttercup clan is summoned for their ancient words of woodland wisdom, to help it through even the most bitter cold or darkness. Hang Vinya wherever her nurturing whispers of strength, health, and vibrance can be best promoted, and let her be a reminder that Mother Nature needs all of us to help the world go round. Through the Fern Glade, and deeper into the Woodland realm, is a miniature world within our own—a world where magic exists, and existence is the very essence of magic itself. Ivy comes from the Dandelion clan of warrior woodland sprites known for their skill with faerie weapons and protective enchantments. The Dandelion clan keeps the realm of Mossvale safe and secure, and you can count on Ivy to send warning whenever danger or negative vibes hover near. Hang her nearby for the utmost protection of your own health and happiness, and let her be a reminder that strength is a rare and vital beauty. Through the Fern Glade, and deeper into the Woodland realm, is a miniature world within our own—a world where magic exists, and existence is the very essence of magic itself. Marigold comes from the Pumpernickel clan of wood sprites known throughout the land for their wizardry with medicines, seasoning and spices. A Pumpernickel always knows which plant offers the best remedy for aches and pains, and when it comes to baked goods, making the mundane magnificent is their specialty. Marigold is always ready with the perfect cup of tea when the situation calls for it, and quick to cure scrapes and scratches as needed. Let her be a reminder that Mother Nature always gives us what we need to get better. In the hidden realm of Mossvale, deep within the Woodlands, is a pond like none other--alive with finely finned folk, called minnow-maidens and minnow-men. Riva comes from the freshwater clan of Summerscales, and she spends her days flipping close beside the banks of the lily-pad grotto, where she also likes to bask in the rays of the sun with her sister Aquabela. When night falls, the two serenade the moon with an ancient tune before diving back into the castles of their underwater realm.